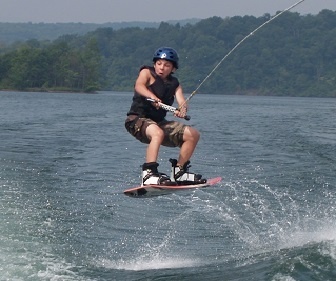 Wakeboarding, Water Skiing and Knee Boarding are literally the most fun activities you can do on water! Whether you are an absolute beginner or a seasoned veteran, our experienced instructors will be there to help you every step of the way. There is no better way to spend a sunny summer afternoon than hanging out with friends on the boat, encouraging each other and learning new tricks on the water. We often say that “every day on the boat is a good day” because of Lake Raystown’s pristine beauty. 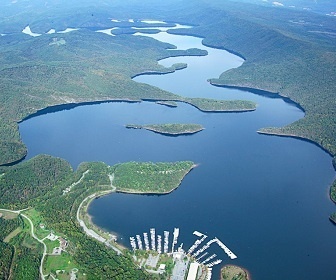 Because of Raystown Lake's size and unique shape, we can almost always find protected bays with pristine water conditions. This makes learning and perfecting tricks much easier. Keeping campers safe on the boat, in the water and on water skis or a wakeboard is always our number one priority. All campers learn the universal nonverbal hand signals to communicate with the boat driver. 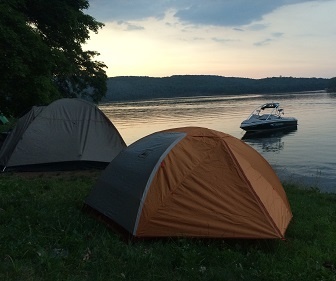 Once a week we offer Wakeboarding and Water Skiing Camping Overnights at where we camp on the shoes of Raystown Lake. Campers will depart camp after lunch and head out the the campground and work as a team to set up camp. The rest of the afternoon and evening will be spent on the boat riding and skiing! Darkness brings dinner, a campfire, stories, s'mores and a well deserved rest in a tent. Motivated campers rise early for a morning session on the boat with amazing, pristine water (similar to a powder day for snow skiers). We then pack up our site and return to camp for lunch with many stories to tell. Click Here to learn more about Camping Overnights at Stone Mountain Adventures. Click Here to learn more about our Wakemasters Program. water skiing, surfing and snowboarding wrapped into one. boats. Campers weave in, out, up and over the wake created by the boat. At SMA Overnight Wakeboarding Camp our goal is to provide quality wakeboard instruction to kids ages 12-16. Along with the instruction, we also will instill character building, responsibility, and safety. If you are a beginning , intermediate or advanced wakeboarder, we will help you get better and meet some new friends along the way. It will be a great summer on the lake.